We’d like to get more ventilation into the van. One way to do it is to add T-vent windows on the sliding door and crew window area. Unfortunately, it’s hard to remove the factory glass without breaking it. CR Lawrence makes some nice replacement windows for the Sprinter that have opening vents at the bottom. Large enough to let in fresh air, but small enough to remain relatively secure. They fit in the sliding door and the crew window space. They are designed to fit in the OEM glass openings and provide the same original “all glass” look. Another alternative is to add a floor vent – maybe in the sliding door step well – that we can open and close as necessary. That has a couple of advantages: improved security and the potential to add an evaporative cooler built in a 5 gallon bucket under the van. We’re undecided at the moment. We might start with the floor vent because it’s much cheaper and feels less wasteful if we have to break the existing window to replace it. Driver side forward window (crew window) with opening vents on 170″ wheelbase is FW621L (Amazon). Driver side non-opening “middle” window for the 170″ is FW622L (Amazon). Driver side rear quarter panel 170″ with opening vents is FW623L (Amazon). Passenger side sliding door with opening vents (170″ and 144″ models) is FW625R (Amazon). Passenger side non-opening “middle” window for the 170″ is FW622R (Amazon). Passenger side rear quarter panel 170″ with opening vents is FW623R (Amazon). Driver side forward window (crew window) for 144″ wheelbase is apparently the same FW621L as the 170″ version, but check before you buy! Driver side rear quarter panel 144″ with opening vents FW626L (Amazon). 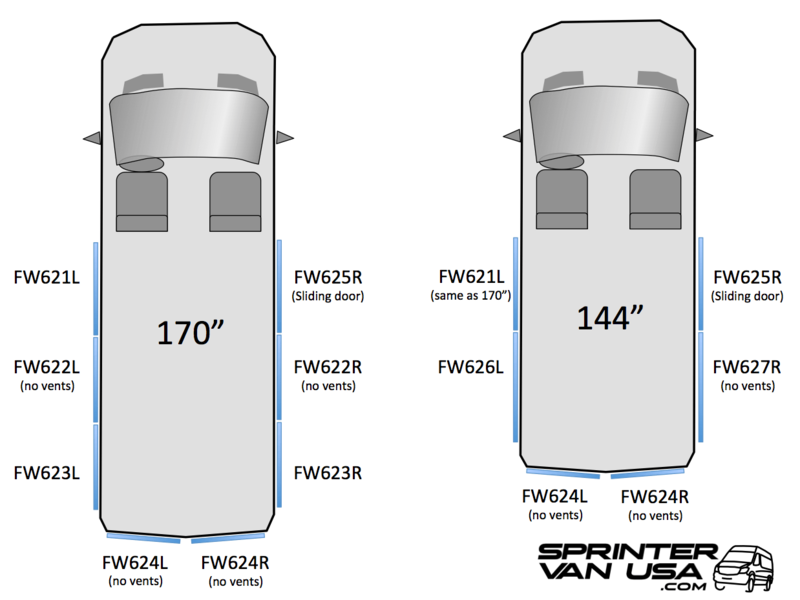 Passenger side rear quarter panel 144″ is not available from CR Lawrence – mainly because of the clearance issues with the sliding door potentially whacking the open vent glass off. They do make a non-opening version FW627R. On the Sprinter Forum, there’s discussion of a mythical Hehr window that has vents that won’t interfere with the sliding door. Oak Tree Vans sourced one for a forum member. The rear quarter panel for the 170 is a different length, so don’t try using that instead. Update: After posting questions about this on the forum, We’ve heard that the CR Lawrence windows can be low quality – both in how well they fit the factory locations and in the waviness of the glass. We’ve also heard that the Amazon seller we’ve linked to above will try to charge an extra ~$150 for shipping. That’s still not a bad deal, but it makes it not as awesome as it first appears. Try to get their demand for the extra shipping charge in an email, and send that email to Amazon as a complaint. Amazon enforced the original price for at least one forum member. Update 2: We should also have mentioned the EuroCampers cab window inserts as a ventilation option. We ended up buying some. They work, but they have some (literal) rough edges. The Sprinter Store wind and rain deflectors are another option we discounted because they’d allow bugs in and would reduce the van security. The Hehr windows are of better quality than the CRL Windows. We had our crew van Windows replaced with the CRL Windows, and they are ok. Feel flimsy. I regret not spending more ($150 a window approx) and getting the Hehr Windows installed vs. the CRL Windows. The window on the slider only has one of the two vents operable, so you are paying a lot for just that one vent. Maybe better use of funds to keep fixed slider glass, and install the Hehr in the rear passenger side (144″). We bought the vented cab metal window screen from euro campers and the fit and finish are dreadful. Super low quality. We used them only once. We had oak tree vans install our Windows and battery system. They did a good job. They can source and drop ship Windows. Thanks for the extra info about Hehr windows and the EuroCampers vents, Dave. We don’t have the vent windows, so I can’t really comment on their security. I did read the same comments on the forum and it made me decide not to put a t-vent window in the slider door. If there’s only an insect screen between potential bad guys and the door lock, then it’s not much of a deterrent. My thought is that it would be much harder to pop the driver’s door lock from a t-vent window on the driver’s side (too far to reach around the B pillar) so that would be a better location for a vent window. At this point, we’re going to experiment with a vent hole in the sliding door step area and see whether that meets our needs. For more ventilation, without having to open the windows, I was thinking of putting two exhaust fans in the roof: one over the bed in the back and one towards the front. Both could be switched to push or pull air. Do you think that would do the trick? Thierry, people I know who’ve added two vent fans say it works really well to move air through the van. Having both of them reversible lets you choose how to have the air flow. The only reason we haven’t done that is because the solar panels take up most of our roof area. What did you wind up doing for ventilation? I am in the same boat and am not sure I want to replace perfectly good factory windows for CRLs. A vent, or two, in in the sliding door step seems like a pretty good solution. The only issues I see are getting kicked when people enter the van and dirt and grim messing them up in the winter. We still haven’t made a decision on this. Probably the sliding door step. I prefer keeping the security of the stock window. Fantastic Fan does now make a non-opening ceiling vent that is 14×14″, but it still needs around 4″ of height and we don’t have that much under our solar panels. It might work out OK for you though. Thanks for the info. I am leaning towards just replacing the window with a CRL. I have heard a lot of folks saying that when you replace the OEM window with a T-Vent aftermarket window, they will leak and the finish when the vent opens will be terrible due to the adhesive. I’m not sure if these “upfitters” don’t want to do the work or are serious. Have you heard anything? I’m sure it’s possible to do a great job with the aftermarket windows, but cleaning up the adhesive from the OEM window and repairing any damage to the paintwork takes time. Time is money for an upfitter, so it’s iikely that the ones who care most will either charge a lot or refuse to do the job, and the ones who care least will not do such a “clean” job. There are also apparently some issues with the aftermarket windows not having the same curve from top to bottom as the OEM windows. That means it’s harder to make them fit and seal all the way around. Again, it’s not impossible to do, but it takes time and patience. So, if you find a good upfitter or if you do it yourself and take your time, I’m sure it’s possible to do a great job. Think how many of those windows have been installed. If they all looked terrible or leaked badly then the aftermarket companies wouldn’t still be in business. The EuroCamper front door vents are actually high quality powder coated aluminum that is made in Germany and would be a better alternative than a second ceiling fan because the front windows are lower than the ceiling. Installation is a breeze and they look good on my 2016 4×4 Graphite Gray Sprinter. Drilling through aluminum makes more noise than cutting through glass, so I’m not worried about a thief cutting a hole in the aluminum to open the door lock when the van is parked and I’m off biking. I’ve used the EuroCamper vents in conjunction with Maxxair fan and a two-part screen over the sliding door opening with magnetic closures in the center. Opening the sliding door definitely increases air flow through the ceiling fan, but I only keep the sliding door open when I’m near the van. Eric, that’s great to hear. Thanks for sharing. We still haven’t worked on a solution yet, so we’ll throw that one back in to the mix. I recently put six CRL windows on our 177 EWB – I was actually surprised at how well they fit and the quality of them. I bought them through DK Hardware (no, I do not get commissions) because the price + shipping was lowest. We had a couple of rainstorms since installation and everything looks really tight. Some of the people who have seen the van couldn’t believe I put them on myself. This is not from some extraordinary talent, it’s just that they are designed well so there is some wiggle room for errors which are never visible after installation. Security is a good point though. Wow – after the sixth window you must be an expert! Thats a lot of ventilation. Good job on the install. I also put CRL windows in a 2016 Sprinter Cargo. I placed the window behind the driver door and the slider without an issue and no leaks . They aren’t perfectly flush but look great and the t-vents have worked with no issues. I just installed the rear windows. Had a professional actually do the final window bonding and he had a real tough time getting the windows to lay flat on the glue bond. I ended uo having to back the van to a wall on the house and use wood sticks to push the bowed windows flush until they cured. CRL really needs some better QC. They are in but bonding them was harder than cutting, priming and applying adhesive. They look great but should not have required all that pressure to seat them.